Uglyworld #886 - How To Relax A Turtle (340-365), originally uploaded by www.bazpics.com. Ever since Babo returned from his "Magykal" trip to the Isle of Skye where he was learning the ancient skills of wizardry he's been telling Mireille and myself that he must study hard for his latest spell. Today we discovered what the spell that he'd been working on for so long actually was, I better let Babo explain, "Well you sees, I had already been ables to moves objects and evens make them disappears, but being ables to controls another living beings is a wholes differents ball game". He continued, "Master Wizard telled me that must finds a small animals that I must try to makes relaxes, so I choosed this littles Turtle who is a hards working members of the Turtle Time Magazine stuff backs on Uglyworld. He works all days and never ever finds time to relaxes, so I dids my magics on him and checks him outs now, totallies relaxed!". 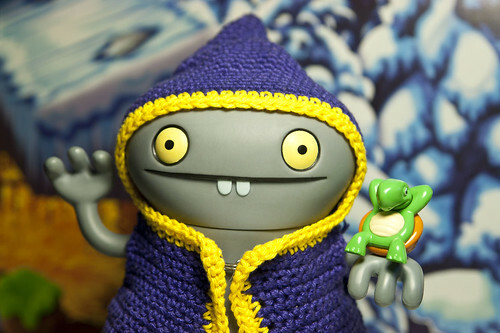 Babo's wizard skills are really growing quickly! That is one awesome magic trick... can you teach me how to get humans to relax?